HP Umpire Ron Kulpa ejected Astros Hitting Coach Alex Cintron and Manager AJ Hinch (strike one call; QOCN) in the top of the 2nd inning of the Astros-Rangers game. With two out and none on, Astros batter Tyler White took a first-pitch knuckle-curve from Rangers pitcher Mike Minor for a called first strike. Replays indicate the pitch was located over the heart of home plate and below the hollow of the knee (px 0.2, pz 1.23 [sz_bot 1.34 / RAD 1.217 ... 0.156 inches of overlap), the call was correct. * At the time of the ejections, the Rangers were leading, 1-0. The Rangers ultimately won the contest, 4-0. These are Ron Kulpa (46)'s first and second ejections of 2019. Ron Kulpa now has 6 points in the UEFL Standings (-2 Prev + 2*[2 MLB + 2 Correct Call] = 6). Crew Chief Jerry Meals now has -3 points in Crew Division (-5 Previous + 2 Correct Calls = -3). *This call was previously INCORRECT due to [sz_bot 1.51 / RAD 1.387 / MOE 1.304], but revised after the fact to reflect the batter's sz_bot of 1.34, making this a CORRECT call. This is the seventh and eighth ejection report of the 2019 MLB regular season. This is the second Manager ejection of 2019. 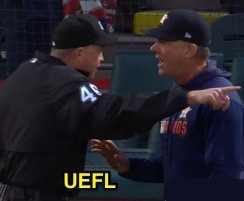 This is Houston's 1st/2nd ejection of 2019, 1st in the AL West (HOU 2; LAA, OAK, SEA, TEX 0). This is Alex Cintron's first career MLB ejection. This is AJ Hinch's first ejection since March 15, 2019 (Angel Hernandez; QOC = U [Balls/Strikes]). This is Ron Kulpa's first ejection since August 27, 2017 (David Peralta; QOC = N [Balls/Strikes]).